As a kid growing up in a big Italian family where food was a priority, this New York native practically grew up in the kitchen. But it wasn’t until trying his hand at a few alternative careers Matthew Berardi landed his first job in the food industry. A locally owned deli where everything was prepared from scratch utilizing the freshest ingredients (there’s a reason Italians believe strongly in homemade pastas and sauces) brought him back to his roots. It was there, he came to the realization he wanted to pursue a career in the culinary industry. 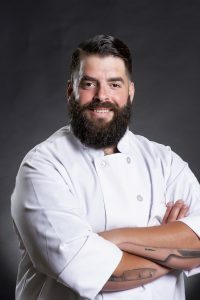 It’s also that attention to process and quality ingredients which fuels Berardi’s food philosophy today and has garnered him praise from both colleagues and students alike. While you might expect him to be partial to Italian cuisine, Berardi doesn’t play favorites and instead takes a creative stance on preparation. “I love to experiment by fusing the flavors of one type of cuisine with the cooking techniques of another,” he says. Aside from the creative freedom, the culture of Upper Crust Food Service is what he finds so appealing in his current position of regional manager. “Whether it’s chefs donating their time to a local cause or making a special trip to purchase a specialty item someone may have asked for in passing, it’s that caring attitude where I think we shine,” says Berardi. When he’s not in the kitchen, he likes to decompress by spending time outdoors, driving his Jeep to a secluded spot in the Adirondacks or camping.